Pamela Moore, born in Sioux City, Iowa now lives in Barcelona, Spain. She earned her BFA in Photography at the University of Arizona in 1984 where she first discovered her interest in book arts. 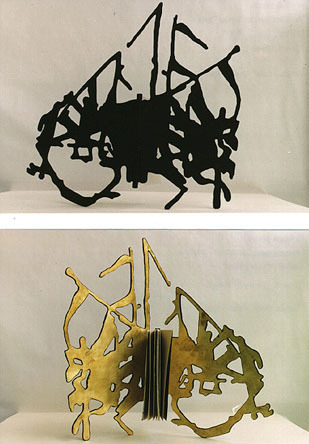 Drawn to the three-dimensional qualities of the book and the alchemical nature of brass, copper and other metals, her books became sculptural explorations of materials, text and form. In 1988 she went to Barcelona where she studied bookbinding and restoration at the Conservatory of the Arts of the Book. In 1993 she traveled to Texas and continued her studies at the J. Sobota Studio. 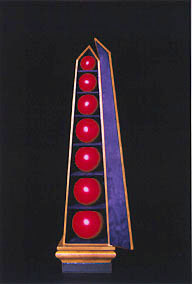 Throughout her career, Pamela has exhibited and sold her work to individuals and institutions. In 1994 she was awarded a regional NEA grant which led to her being selected as an artist for the IAPN cultural exchange program which has taken her exhibition "Imaginary Library" to Greece, France and Spain. The images shown on this web page are taken from this show. She continues to create book art and practice bookbinding and restoration in Barcelona, Spain. Her work can also be seen online in "Pamela Moore's Imaginary Library." Her sculptural design bindings in Imaginary Library explore the concept of book as object and as sculpture by incorporating the elements of light, texture, time and space. Pamela Moore is on the web at www.liberinto.com. Itinerario de Extasis is a dos-a-do binding of the graphic work of a 17th century German scientist, astronomer and draftsman - Athanasius Kircher. The wooden covers are carved all the way through, then covered with calf skin. They reflect the labyrinths of his designs which are illustrated in the text. This book is an homage to his life's work. Obelisk or Planetary Clock is a three dimensional interpretation of a drawing by Athanasius Kircher. It is contructed from binder's board covered with calfskin and copper. The interior is covered with blue suede, the spheres are wood covered with red leather. This sculpture forms part of a series of copper geometric shaped books, that I have been developing over the last six years. This particular piece pays homage to Kircher's use of universal sybolism to communicate ideas that cannot be expressed by any single spoken or written language. Agricultural Notation is a sculptural binding of a book of etchings by Ladsilav Hanka. The binding was inspired by the script-like verse of Hanka's etchings. I attempted to recreate three-dimensionally the poetic nature of the drawings by extracting one gesture that would accentuate his sensitivity to the musical and calligraphic qualities of the cornfields . The brass doublures visually suggest the forms of corn in sunlight while the black side reflects the inherent poetry of nature in its silhouette form. 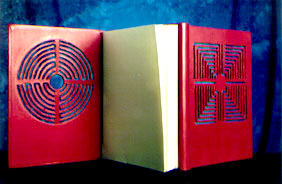 Philosopher's Stone is an artist's book containing the fundamental text of alchemical philosophy, The Emerald Table. 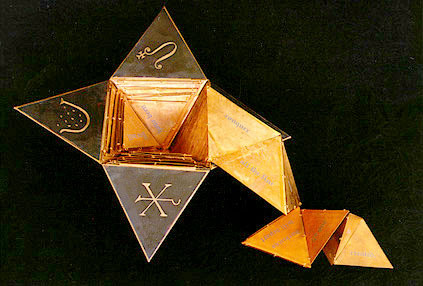 The rhombus shaped book is constucted of binder's board and copper. The copper pages fold out accordian style creating a labyrinth design when entirely open. Philosopher's Stone is the expression of a search for spirituality through the creative process.